The Turkish Van is a rare and ancient breed that is particularly remarkable for its love of water. The Turkish Van or "swimming cat" evolved in the region around Lake Van in Turkey and developed the habit of swimming out into the harbour to greet the incoming fishing boats in the hope of scoring a free meal. Today it thrives in Iran, Iraq, southwest Soviet Union and eastern Turkey. It was brought to England in 1955 and the name was later changed to Turkish Van to avoid any confusion with the Turkish Angora. The Turkish Van is a long, sturdy animal with tufted paws and a short, wedged-shaped head with a long straight nose and, being a swimmer, it has a water-proof coat that does need some grooming. Despite moulting extensively during the summer, they do keep their beautiful brush-like tail throughout the whole year. Their love of water is no exaggeration and they are quite happy to join in family activities that involve water such as washing the car, doing the dishes or even taking a bath! 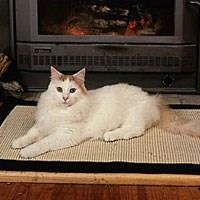 While the Turkish Van can be shy around strangers, they are extremely affectionate towards their owners. They boast a quiet voice, a hearty appetite and a relaxed personality that allows them to adjust easily to most situations.